Located 8 miles west of Aberdeen, it is a pleasant place to visit with extensive grounds, woodland walks and historic rose garden. Inside there is lots to see too - portraits, furniture, vaulted ceilings decorated with shields, great hall, 16th century chapel, and much more. Well worth a visit. Small shop, tearoom and children's playground also on site. The castle is run by the National Trust for Scotland - click here for opening dates/times. Keep up-to-date with the official Facebook page. Visit the Clan Irwin Association web site for details about the Irvine family connections with Drum. 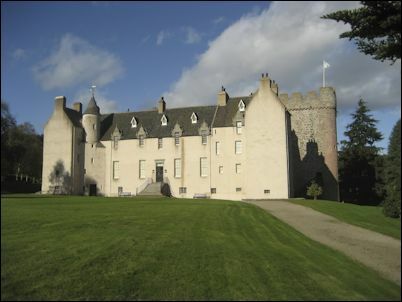 Possibly the oldest occupied castle in Scotland, Drum Castle in Aberdeenshire, was home to the Irvine family for more than six and a half centuries, a full twenty-four generations of nearly unbroken succession. The original tower keep, standing seventy feet from base to battlement and fifty feet on a side with walls twelve feet thick at the base is thought to have been built during the reign of Alexander III in the mid-thirteenth century. While the architect of the Tower of Drum is unknown the work is generally attributed to Richard Cementarius, the first provost of Aberdeen. Several prominent interior features of the tower are identical to other structures that are known to be the work of Cementarius and so Drum Tower is credited to him as well. 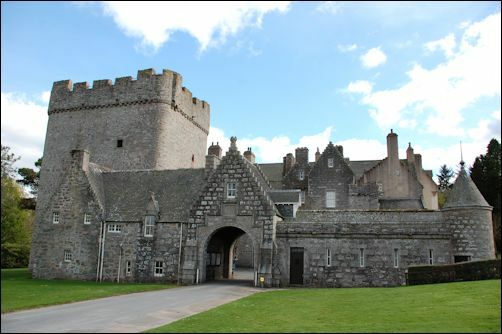 The rambling stone mansion and Jacobean house that now surround the original tower were built during the reign of Alexander, the 9th Laird of Drum and completed in 1619. 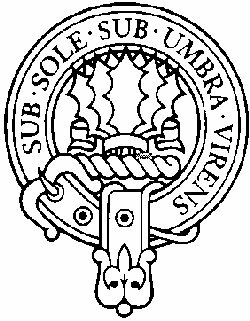 'flourishing under both sun and shade' One branch or another of the Irvine family has been involved in nearly every major event in Scots history over the past 1,000 years. Their story begins with three brothers Erivine - Erinus, Grim and Duncan. They were the grandsons of Duncan 'the first of the Eryvine' who was killed at Duncrub in 965A.D. The eldest brother, Erinus, inherited his family's titles as Seneschal of King's Rents, Athbane of Dule and Abbot of Dunkeld, and stood second in rank only to the King. As such he was wed to the eldest daughter of King Malcolm II, who was himself the great great great grandson of Kenneth MacAlpin, in 1004. The second brother, Grim, seems to have dropped out of history altogether but the third brother, Duncan, became the ancestor of the entire clan. He moved south to the borderlands and in 1018 married an heiress whose inheritance included the lands between the Kirtle and the Esk Rivers, southeast of Lockerbie. They built the Towers of Bonshaw on the banks of the Kirtle and, as the family grew to fill them, many manor houses in what became the ancient home of the Irvine clan. Malcolm II had three daughters but no male heir and failed to produce one before he was assassinated in 1034. The throne, which had been held for two centuries by the descendants of Kenneth MacAlpin, was filled now by the grandson of Malcolm and son of Erinus, Duncan Erivine I. During his reign, Duncan met with defeat in his campaign against the Norsemen and led the remnants of his army home again in 1040. But on the way he was attacked and killed by his first cousin, MacBeth the Usurper who assumed the throne and ruled for the next seventeen years. Erinus himself was killed by MacBeth's forces in 1045 while seeking revenge for the murder of his son. The sons of Duncan I remained in hiding throughout that time until 1057 when Malcolm Erivine raised an army to challenge MacBeth. With the aid of Lord MacDuff, Thane of Fife, he defeated and executed the Usurper that same year. Malcolm defeated MacBeth's stepson, Lulach, two years later, regained his father's throne and became Malcolm III. This succession included David I (The Saint) who created all the offices of the royal court and William 'The Lion of Justice' who created the lion rampant as his battle crest and coat of arms. The line ended with Alexander III when he rode his horse over a cliff in pitch darkness in March of 1286. Alexander III was predeceased by all his heirs and with his death, the succession was thrown into wild dispute. No less than thirteen claimants stepped forward to declare their right to the throne, all through some relation to the line of Irvine. John Balliol, the primary claimant, was great great great grandson of David I, while his only serious rival, Robert the Bruce, was great x4. Edward 'Longshanks' of England then imposed his will and chose Balliol from among these rivals to be King of Scotland, so long as he acted in ways that pleased London. When even the compliant and dutiful Balliol could no longer bear to follow the direction of his English benefactor, he was deposed and imprisoned in London. Now only Balliol's nephew, John 'Red' Comyn, stood between Robert the Bruce and the throne. These two agreed to meet at the Church of the Grey Friers in 1306 to resolve their differences. That discussion ended when in the heat of argument, Robert put a dagger through Comyn's heart. During his campaign, Robert often sought help and refuge from his kinsmen, the Irvines of Bonshaw. He chose from among them, William de Irwyn as one of his principle aides and companions. As the story goes, at one point King Robert found himself put to flight by his enemies with only his aides around him. Exhausted by the chase, the King was compelled to sleep under a holly tree while William stood guard over him. Holly leaves are a prominent feature in all seven family crests which represent the major branches of the Irvine clan. William stood by King Robert again at Bannockburn in June of 1314 and for his service was awarded the Royal Forest of Oaks in Aberdeenshire and Drum Castle which guards it in 1323. This land had previously belong to John Comyn and Robert, as king, was free to do with is as he pleased. Drum was made into a free barony in 1329. Alexander, Third of Drum, marched away to lead the forces of Aberdeenshire with his cousin the Earl of Mar to meet the invaders from the Hebrides. This was the battle of Harlaw in 1411 before which Alexander made his brother swear that should he be killed, Robert should assume his baronial right at Drum. During that battle, Alexander encountered the ferocious Chief of the MacLeans of Duart in Mull, known as Red Hector of the Battles. After 'noble and notable single combat' the two of them lay dead upon the field, killed by mortal blows struck one upon the other. Younger brother Robert took the oath he swore to his dead brother quite seriously, changed his name to Alexander and married his elder brother's fiance, Elizabeth de Keith. Sometime later he led the delegation which negotiated the release of James I from the hands of the English for which he was knighted. 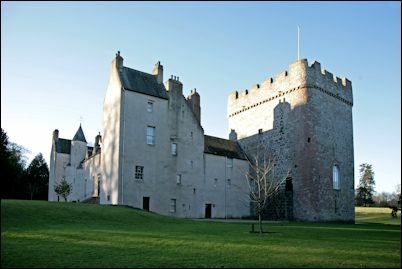 Drum Castle was plundered to its stones three times during the Covenanting Rebellion throughout which the royalist Irvine's supported the efforts of Charles I. Alexander, 10th Laird of Drum, his brother Robert Federett and his two sons were imprisoned at the Tolbooth in Edinburgh more than once during this time and Alexander was fined 10,000 marks for his loyalty. His younger son, Robert, died there February 4, 1646. The Irvine family remained intensely loyal to the Stuart royalty. The 14th Laird took part in the Jacobite rising of 1715 and Alexander, the 17th Laird joined Bonnie Prince Charlie at Culloden in 1745. He managed to escape imprisonment and forfeiture though he was twice charged with treason. The 24th and last Laird of Drum, Henry Quentin Forbes Irvine, bequeathed the house and 300 acres of ground to the National Trust for Scotland on his death in November of 1975. It has been open to tours from that time and remains the classic Scottish house.